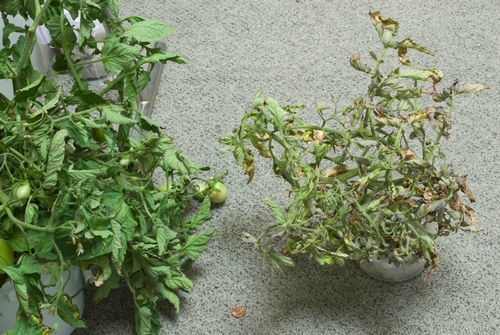 Are my tomato plants damaged by a chemical or a disease? 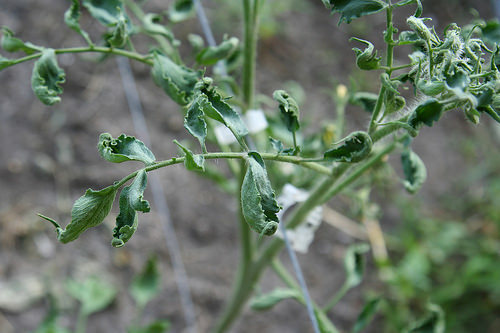 Most of my tomato plants have started showing signs of what I think is Cucumber Mosaic Virus. I have shoestring, fernleaf, and curling leaves. They also have a leathery appearance. At first I thought this was the plants reacting to being moved into the full sun, but the new growth continues to look like this and there's no signs of it getting better. More pictures, and higher resolution, can be seen here. Update 6/20/14: After talking to a local farmer, and as suggested below, this looks like it may be herbicide damage. Even though we don’t use herbicides that doesn't rule out drift from a neighbor using it. Another possibility is they could have come in contact with algaecide, another pool chemical, or Simple Green while they were stored on the patio before being planted out in the garden. After posting this I came across some blog posts from someone who had gotten contaminated soil, his plants show similar symptoms as mine. You can read those here, here, and here. At this point I'm pretty confident that the issue is due to a chemical and not a virus. I'm gonna chance a sort of answer/query - I'm not certain it's viral because there is absolutely no evidence of mosaicing or yellow patching, even in the extra photos with higher resolution. What it smacks of to me is weedkiller damage, or at least chemical damage of some sort, but you say not all your plants are affected, so the big question is, were the affected plants all in the same area, away from the others, or were all your plants together? I ask this because if it's chemical or spray drift, you'd expect all the plants to be affected if they were in one place, but not necessarily if they weren't. The other thing is, are they all planted in the same potting medium, both the healthy and unhealthy plants? This does look like a virus. 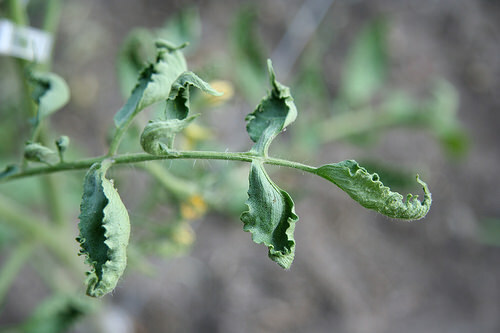 Probably Tobacco Mosaic Virus which is the most common for tomatoes, peppers, eggplants and tobacco. Do you smoke? Have you had any friends over that do? If tobacco users come near your plants, insist they wash their hands first. If your plants are in a greenhouse never allow any smoking in your greenhouse. I wouldn't allow anyone who smokes anywhere near my greenhouse. Make smokers scrub, put on a mask, wear booties over their shoes and latex gloves. One thing I've heard of that might work is milk...pour milk into the plants that are affected. I'd get all the plants that have this isolated from your other plants to try this. Milk is supposed to deactivate the virus. I've never tried this myself but pretty reputable sources have mentioned this as 'possibly working'. Otherwise, the best thing you can do is get rid of all of the affected plants. There is no cure for virus. Dispose of the soil, if in pots. Don't plant any of the tomato family in the soil if this is in your garden. Sterilize your pots before using them again. Don't compost these tomatoes. Make sure you sterilize your pruning tools before using them again and in the future, if you are going to prune anything, always use alcohol on your tools before and after each plant. 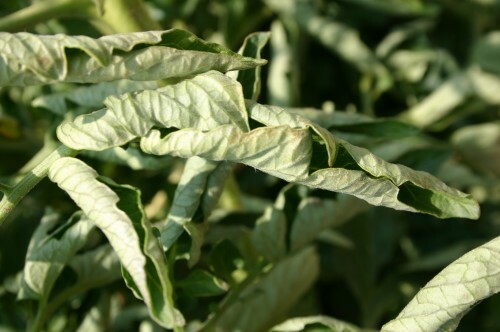 Look to see if the variety you want to grow is TMV resistant. If you've got tomatoes that are still healthy (NO signs of virus) check to see if they are TMV resistant versus the tomatoes that got infected. Tough to lose nice plants like this but at least you can suss out what happened so it won't happen again. Keep a close eye on your healthy tomatoes. 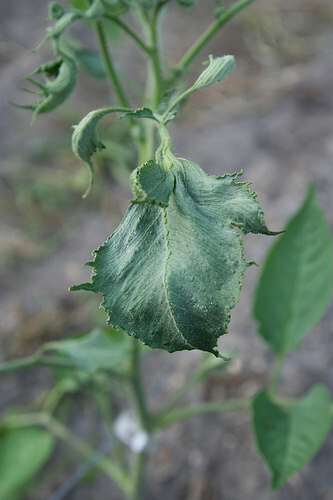 If just one leaf looks like it is infected, the entire plant is infected. Isolate and try the milk. If that doesn't work you have to dispose of the entire plant. 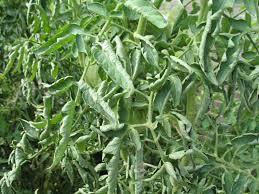 Be aware the virus is now in your soil and any other tomato or plant in the tomato family will be susceptible. I think I have it. That looks a lot like tomato yellow leaf curl virus. This can cause curling without yellowing (see matching pics). It is spread by adult silverleaf whiteflies, which makes sense in your case (enclosed). It also explains why only the tomatoes have been affected. Unfortunately there is no cure, so if the plants don't recover on their own (rare), they should be destroyed. This is without a doubt a herbicidal injury. I live in rice country and get FACET drift (A herbicide sprayed for weed control on rice fields) every year (along with everyone in the area) on our garden tomatoes. The first lower tomato settings will ripen while the rest of the above plant will barely thrive. The next bloom set will put on tomatoes but in very, very slow motion. a few will get ripe. By late summer/early fall when the weather starts cooling the plants will come alive again and load down with tomatoes, but most won't have time to get ripe before frost unless frost holds off for an extra couple weeks. I live in Arkansas, zone 7. Zones 8 & 9 have later frosts so have a much better chance for fall crop. That is, in the case of where rice is grown and facet and some other chemicals are used that may drift. I would like to suggest two answers: I have very similar leaf symptoms. I destroy all seedlings that: curl away from light. Show any abnormal color. Grow slower than the others! Have veins that are not normal. This is how I've been able to continue after TMV, and Beet leaf curl virus. But it's an ongoing battle. Answer one; I sometimes use growth factors / hormones on certain plants. And some plants can react much better if they get a few parts per billion of 2-4D, with their cytokines @ ppM. I notice that sometimes the 2-4D settles to the bottom, and can zap the last plant that gets sprayed. The tomato's w the symptoms have been sprayed. Answer 2: I also see a few whiteflys that are lingering here and there, and a Tobacco User who also is known to linger, lol. They both can be carriers of tomato virus. Two answers? 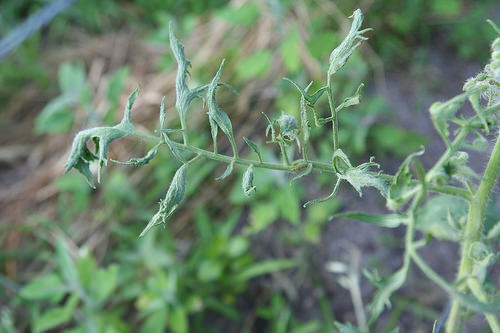 Over-plant those tomato seeds, and cull all slow growers. Plant 8 ~ 10 times what you need. Best of luck! .. .
Not the answer you're looking for? Browse other questions tagged diagnosis tomatoes diseases chemicals or ask your own question. Should i prune tomato fruiting trusses?